Tired of replacing the batteries on your remote especially since you have been glued to the TV a lot during the 2010 World Cup? If the batteries on your remote control run flat, just give it a good shake and hey, presto, you should be able to change the channels! Provided that you have vibration-powered electricity generator inserted into the remote control. 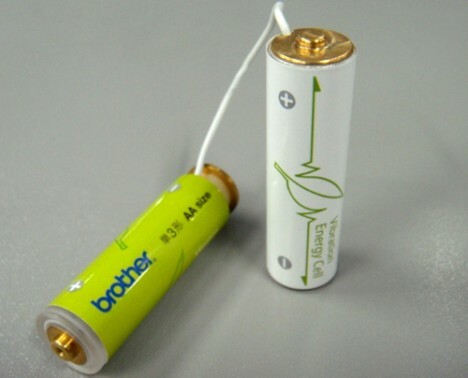 Japan’s Brother Industries Ltd. has produced an innovative energy harvesting device based on vibration that can replace AA and AAA batteries. Shaped like a battery on the outside, the energy harvester is equipped with an electromagnetic induction generator and a 500-mF capacitor for storage. It generates about 100-mW of power which is suitable for small devices; the remote control, for instance, only needs between 40-mW and 100-mW of power to operate. The output of the AA-size generator is 10 to 180-mW, providing power at 1.6- and 3.2-volts, while an AAA unit that generates 2.7-V has also been produced. There is no need to keep replacing AA and AAA batteries with this environmentally-friendly kinesthetic or vibration electricity generator.